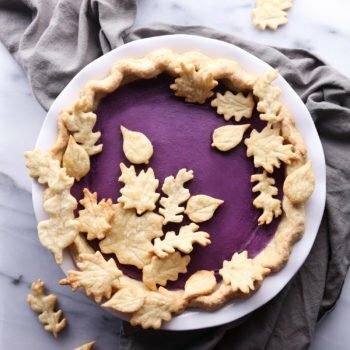 This delicious vegan friendly sweet potato pie is made with purple sweet potatoes, which gives it a gorgeous color while maintaining the classic flavor. It's also free of dairy, eggs, and refined sugar, and can also be made gluten-free by using the gluten-free crust option. Comine flour and salt in a large mixing bowl. Cut in shortening and/or butter with a pastry blender or fork until mixture is crumbly and no large clumps of fat remain. Stir in sweetener and water, a tablespoon at a time, just until dough comes together. It should be soft but not sticky. If dough is crumbly, add more water. Divide dough in half, covering the second half. Take the other half and roll into a large circle. I roll in between two pieces of parchment paper to keep it from sticking. Use parchment paper to invert dough into a 9-inch pie pan and carefully fit into the bottom and up the sides of the pan. Trim excess edges and crimp or decorate edges as desired. Cover and place pie crust into the refrigerator while you make the filling. these leaf cutters as well as these cutters. Use the back of a knife to gently create veins in the leaves, being careful not to cut all the way through. Place cut outs onto a parchment lined baking sheet. Brush with milk and sprinkle with sugar (optional). Bake for 15–20 minutes, until cut outs are lightly browned. Remove and let cool completely. Decorate pie as desired. If you want to decorate the crust of the pie, you can also place dough cut outs onto the pre-baked pie so the cut outs bake into the crust. I find the filling too liquidy prior to baking to hold the cut outs, that's why I decorate the top after baking. Preheat oven to 375ºF. Peel and chop potatoes. Measure out 3 cups of diced potato and place into a large pot. Cover potatoes with water and place pot on the stove. Bring to a boil over high heat, cover, and reduce heat to a simmer. Cook potatoes until fork tender. Drain and place back into the pot. Mash slightly and measure out two packed cups. Place mashed potato into a high powered blender. (If you don't have a blender, use an immersion blender or hand mixer) Add milk, maple syrup, butter, cornstarch, vanilla, cinnamon, and nutmeg. Blend until smooth. Place into the oven on the middle rack and bake for 45–55 minutes, until filling is set. Center may still be a little soft, but will firm as it cools. Remove from the oven and cool completely. Store covered at room temperature (in a cool room) or in the refrigerator. *Use a single pie crust recipe if not decorating with cut outs.